There is an air of mystery and deception about this Viola that goes beyond its off-putting name, but a clue to its Asiatic origin lies in its synonym ‘koreana’. If imitation is the sincerest form of flattery, V. grypoceras does well in the way it mimics the silver marking and green shades of some Cyclamen, like C. persicum, and in the clustering of its leaf stems. 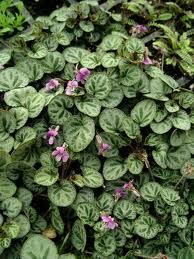 Eye-catching foliage isn’t the only reason for recommending this plant – although that was sufficient for me. The fact that it does not flower is really the clincher. In the four years I’ve had my specimen I haven’t discovered why it is completely cleistogamous, but suspect it is a survival mechanism to counter its vulnerability to attack from slugs and snails. For that reason I’ve never risked border cultivation, realising after first year devastation in its plastic pot that a place of safety in a suitable container was the only way to outwit the marauders. Seedlings emerge every year from the obscure activity earlier but hopes of developing a stock are dashed repeatedly because the babies resent, fatally, the slightest impairment of the their long, hair-like roots. In 2009 fate smiled because a chance seedling germinated remotely, was potted on successfully and has produced one seed capsule standing proud of the foliage but so far (late November ’09) unopened. If I can develop sufficient stock I’ll be glad to share my rare treasure with the Group, but in the meantime anyone drawn to the Viola should try Daisy Roots. If Anne can’t supply, Beeches Nursery at Saffron Walden is listed as a source in the current Plantfinder.